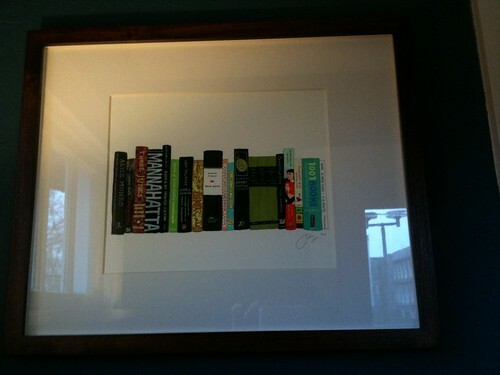 I realized that I never posted about the Ideal Bookshelf that Jane Mount, a New York artist, painted for us. This was Telfer’s Father’s Day present and I picked it up shortly before I ended up in the hospital so I never mentioned it. It hangs in our entryway and we just love it. So April’s Bookshelf is the books represented in the painting with one exception – I loaned Encyclopedia of an Ordinary Life by Amy Krouse Rosenthal to my mom. 1001 Books to Read Before You Die | Peter Boxall, ed. Did you have Mount paint those particular books (love the art!) or were the books something she put together? Great piece! 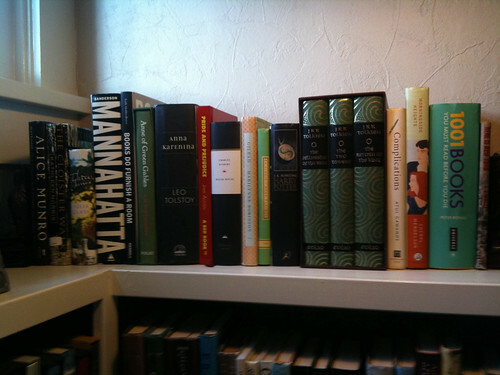 You pick your “ideal bookshelf” and either take the books to her or send her a picture. Ideally (pun intended) she can paint the bindings of the actual copies you have if they are special to you. Pretty fun. Telfer — awesome! I love it! Now, you might need to explain how you guys came to “this” being the ideal bookshelf. So fun!